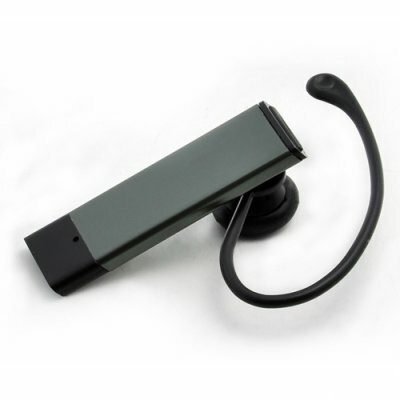 Successfully Added Bluetooth Wireless Headset - Worlds Lightest Bluetooth Earpiece to your Shopping Cart. New Bluetooth Wireless Headset type earpiece in new lightweight ultra-thin design. This is a great communication companion to your mobile phone, for convenient, handsfree operation. With integrated Bluetooth now a standard feature in modern mobilephones, from high-end smartphones to low-end functional models, this compact Bluetooth earpiece is a must-have accessory for anybody who uses their cell phone regularly. Easy and comfortable to wear with a detachable ear hook that fits either ear, the ergonomically designed CVSB-B12 Bluetooth Wireless Headset - World's Lightest Bluetooth Earpiece provides you with high quality audio and an omni-directional microphone that always clearly picks up your voice. Simple to use and accessible, this Bluetooth Wireless Headset is manufactured with a new ultra thin (4mm) featherweight design (less than 5 grams), making it feel like your ear is wearing nothing at all. Add to that its single press button at the top of the earpiece that allows for convenient control of standard functions including answering and ending calls, and you may just wonder why it ever took you so long to get Bluetooth earpiece! Ideal for those with a busy lifestyle, this stylish wireless headset is designed for those who want the convenience of handsfree, wireless communication to maximize the use of their time. Commuters and, in particular, drivers will find this device the perfect companion to ensure their safety while driving. This product is in our warehouse right now and available for single piece sample orders or bulk stock purchases. Upgrade to the latest in Bluetooth technology today! Total ergonomic design combines featherweight comfort with ultra thin profile - the CVSB-B12! Charge up the unit overnight (4-6 hours) before its first use, this will provide you with peak battery performance for the life of the product. By doing a simple pairing with your Bluetooth capable mobile phone, smart phone or PDA, you will be ready for an active day ahead and have easy access to all your calls. In addition, you can also easily pair it with a Bluetooth capable laptop/notebook computer, so feel free to wear it to talk online all night. Bluetooth version 2.0 for faster pairing and connection, improved call quality and lower power consumption. Also compatible with Bluetooth version 1.2 and 1.1 devices. The talk time is around 3-4 hours. What is the passcode for paring the Bluetooth earpiece? on 2010-05-10 02:39:53 This is surely a must have!! This is surely a must have!! Very convenient, practical and also stylish.Excellent value for money. But expected can be charged through PC USB.